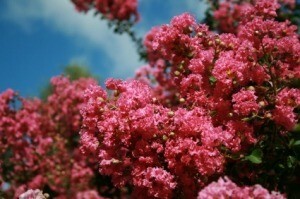 Crepe myrtle likes full sun, but in drought conditions or even when it's rainy, the flowering may be delayed. This guide is about crepe myrtle not blooming. I've had a crepe myrtle for 10 years that has never flowered. It is full of buds, but the buds never open to bloom. The tree looks healthy and would be beautiful if the blooms would open to flowers. The tree is in a west location in the middle of the yard and it gets sun from mid-morning to night. It is watered once to twice a week (although during rainy periods it receives more water than that). Is there a flowerless variety that I happen to have, or can I take some action to get my crepe myrtle to flower? I'm not sure, but it sounds like either too much or not enough water. Call your local nursery and ask them. They know the right information for your climate. I would have your soil test and the results discussed with a horticulturist. It may be a plant that requires specific minerals or soil conditions in order to bloom, or some plants require 2 to propagate each other. I have two crepe myrtles, they are around 7 yeas old, they have never bloomed. I have fertilized, fed, etc. over the last five years. They are beautiful trees, just no blooms. I need some ideas as to what else I might try. Stop fertilizing and watering as much, and make sure they are getting full sun. I have read that a handful of epsom salts around the base of the shrub/tree will induce bloom. Scatter the epsom salts and water in. This should work like a charm. What can I use to make my crepe myrtle trees bloom? I've tried a variety of fertilizers with no luck. Did you recently prune your tree? If the crape myrtle was pruned in late spring, normally it won't flower. You should never prune the crape myrtles once they start growing in spring. The new shoots are what give rise to the year's blooms. Trim them back, signifiantly. Feed them some Miracle Grow (or similar food). They are much prettier if you keep them trimmed as a bush - not a tree. If you pruned them at the wrong time, they won't bloom. Either prune them in the early spring before they bloom, or after they finish blooming. I have 4 mature and 2 young different color crepe myrtle trees that only bloomed a handful of flowers. In previous years they produced massive quantities of blooms. My myrtles show no signs of any distress. I am so confused and upset. What happened? Hi you might want to try some tree food stakes or talk with someone at the closest Lowe's garden center they should be able to help you out with that. I have a creeping myrtle that is slowly dying. Any suggestions? I too have had that problem. I removed the tree from it location to discover the root system had enveloped itself and was suffocating the plant. I cut and loosened the root ball and stuck it in a large pot with some good quality potting mix. I almost immediately came back to life. 3 weeks later I now have a tree that has good healthy foliage and is blossoming slowly. Will bone meal help it bloom? When can I use bone meal? Our crape myrtle trees are 3 years old. It is August and they have no flowers and the leaves are falling off. What can we do for them? I planted a crepe myrtle tree about 3 years ago. It has grown in size and is probably about 9 feet tall now. However, it has never bloomed. It had flowers when we first got the tree, but after that they never came back. Do I need to prune the tree in order for it to bloom? I get sad every year when it doesn't bloom. I have a very large Crepe Myrtle that doesn't bloom much, but it's very tall and not bushy at all. What's the problem. My other Crepes didn't bloom much this summer either. The number one most common reason Crepe Myrtles fail to bloom is improper pruning techniques (or a lack of pruning altogether). Crepe Myrtles bloom on the current season's growth. If they are pruned too late, all the new wood is removed and the flower buds never develop. Pruning should be done only after the tree flowers. You said your tree is very large so it may be older. Declining Crepe Myrtles can be revived by pruning. In the dormant season, some of the extraneous branches are cleaned up and removed, opening the interior of the plant to more sunlight and air circulation. Be careful not to commit "crepe murder." Just cut the branches to enhance the natural, overall appearance of the tree, don't whack them all back to one height. The second most common reason Crepe myrtles fail to bloom is a lack of sun. These trees need a lot of sunshine if you want them to bloom. Are there any trees nearby that may have grown up and around your Crepe myrtle and are blocking some sun? Is your tree otherwise healthy? Do you see any signs of insect damage or disease? Stress from either can be enough to prevent your tree from blooming. Is your tree getting too much nitrogen or not enough phosphorus? Trees in the middle of a chemically treated lawn or near garden beds that are heavily fertilized may be getting too much of a good thing when it comes to nitrogen. This promotes healthy leaves, but inhibits flowering. Try adding a little bit of bonemeal as mulch around the tree. This will add phosphorus to the soil over time and you don't have to worry about overdoing it. My crepe myrtle is not making blooms. Our Crepe Myrtle trees are 6 or 7 years old, but only bloom occasionally. The trees are full of buds, but they never open. We water the trees weekly. We have seen trees in fields that only get water when it rains and they are full of blooms. Any ideas? Crepe Myrtles "do not" like to be watered that often. Cut back on your watering. They flower better that way.